Post your single best hiking related shot of 2014. Tell us why it rates #1 for you - memory, technical, difficulty taking, ascetics? Every time I look at this shot it makes me smile remembering the infectious energy and good nature of this young man. Hayden is the son of one of my old climbing buddies in Utah who came with his parents on an old folks desert hiking trip this fall. He actually seemed to enjoy our campfire rambling about epic climbs (and music choices from the 60s & 70s). Watching him scamper around like a puppy on our canyon hikes though was the highlight of the trip - one minute he was with us, I'd stop to take a picture, then look up to find him 100 yards up the canyon or down some side slot, scrambling on a pinnacle or ledge, then he'd do a stall (one hand breakdance balance position) if I asked him to pose for my camera. He likely went half again the distance we did, but still had energy to burn at the end of a long day. That's a fantastic shot, Jim. Southern Utah is hands down my favorite outdoors area in the states, so your image really resonates with me. You've done a fine job in capturing his energy on a single frame. I took this shot of the Seattle skyline on Sunday from Mount Defiance on the Ira Spring Trail. I hadn't seen Seattle so clear from this distance (50 miles) before, and everything seemed to line up well for the shot. 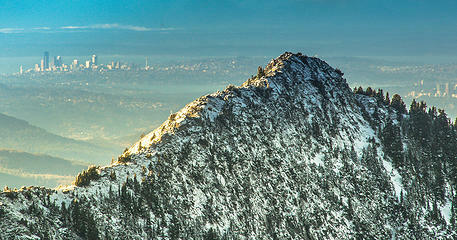 It was super clear yesterday and from 50 miles away on top Mount Defiance, Seattle was visible. 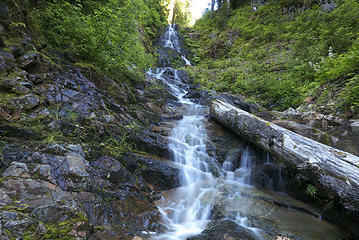 I have a rule to not repeat hikes, but with one exception -- The Rampart Lakes area in the fall. I try to get there every year in October when the blueberries are turning color and the snow begins to fall (usually). This year's trip to Dungeon peak was a new wrinkle, but equally rewarding as the many other trips to that area. HiBox kept poking through the mists and this picture captures for me a spectacular fall day, my favorite time of the year for being in the mountains. 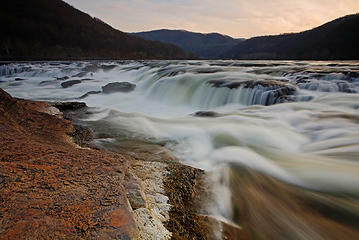 The above photo was taken in the New River Gorge, in West Virginia. At this spot the New River, which has been designated a "National River", is quite wide and drops down in a complex of waterfalls, collectively called Sandstone Falls. Foot bridges and some rock hopping allow one access to an island in the thick of the action. There are a number of compositions on offer. I selected the above photo over some of the others I took there because of the extra drama that I felt the foreground conveyed. Other than that the spot speaks for itself. I'll go with this one. 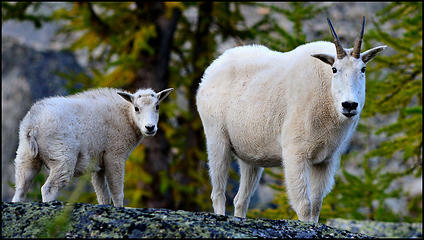 These goats came into our camp at Upper Cathedral Lake in September. They spent an hour or so with us, wandering around, looking for pee spots, as we packed up for the long hike out. It's memorable for me because of the place, which I think is one of the most beautiful in Washington state, and because of the three guys I was with, great people and great trail companions. I'll never forget that trip. Great shots everyone, thanks for participating. BolsaDeHielo, that shot looks like CG from some futuristic movie, very strong composition too. 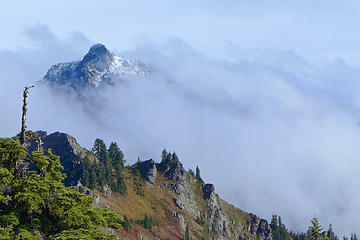 puzzlr, I love days like that - peaks appearing out of the clouds lend mystery and drama. I can sit, watch, and of course shoot, scenes like this for hours. Gali, a classic shot of yours - that is very cool that you can get into the middle of such a large river. Gil, love the sharp focus and nice bokeh, what lens were you using? This trip was special for me because I've wanted to do an overnighter in that valley for years. I had always hurried past this spot, eager to get to Mineral City and back to the truck by mid-afternoon. With no such time constraints this time, I was able to relax and take my time playing with shots. Also, it was my first trip with my new camera (Panasonic FZ-200) and my first trip using a ND filter. Some great photos on this thread! 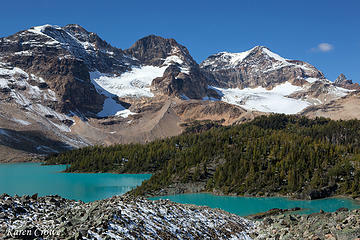 Puzzlr, I love the Rampart Lakes in fall, Hibox is stunning with a frosting of snow! 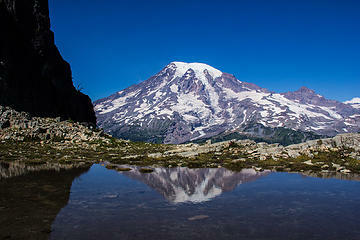 I like this image not only because it's a beautiful and somewhat unusual shot of Rainier, but also because of the adventure associated with it: we had spent the whole day scrambling around in the Tatoosh Range with an extremely inadequate map when we happened upon this little tarn to the East of Pinnacle Saddle. Up until this point we had wondered how we were going to get down off the ridge, since every direction seemed to present us with impassable cliffs or treacherous, loose scree. It was here at this little lake that we were able to look down into the basin to the north and find a well trodden climbers path leading down to Reflection Lake. I've been meaning to post a trip report about this hike, maybe I'll finally get it written over Christmas vacation! Hi Jim: that was my 30-year-old Nikkor 80-200mm f4 manual lens. It does well on the D600. Great photos so far! 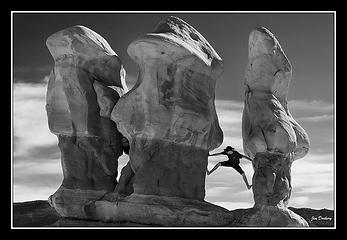 Nice one to start the thread with Jim, very cool shot, good choice as a B&W. While I wasn't as serious about photography this year as I have been in the past, as usual l I'm going to go with a photo that means a lot to me emotionally instead of my best technically. I started planning this trip about year in advance to more of a remote area with very little beta available. It all came together with a day's notice with two very cool people. We had lots of laughs and saw some incredible sights. Remoteness, research, hard work, fun people and spectacular scenery = the right recipe for an awesome trip and good photography. I leave only footprints...and lens caps. 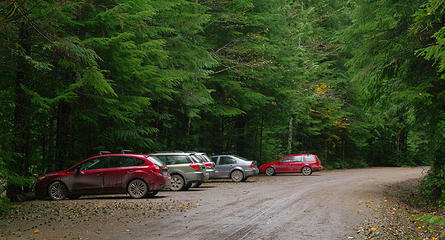 cars at the Suiattle River Trail trail head. 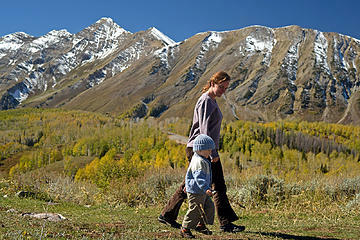 A little fall color, sun, a dusting of snow, mountains, hiking, and family. I'm loving this thread. Let me try to find a worthy addition. 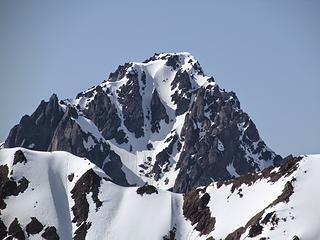 Standing on Del Monte Ridge this spring on my first mountain overnight of the year and looking over at the route on Mt Deception that I'd gone up the fall before and thinking how little that looked like the sort of thing I'd do. 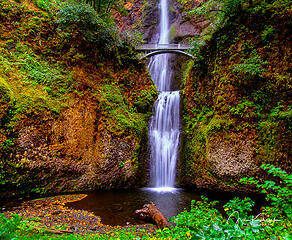 Multnomah Falls in the Fall. Shot in a light rain that really brought out the foliage colors. "May your trails be crooked, winding, lonesome, dangerous, leading to the most amazing view..."